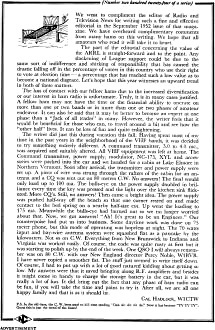 As the opening sentence indicates, National Company ran a very long series of advertisements in QST magazine that were in a format more reminiscent of a short essay than a company promotion. This installment for the December 1952 edition was number 224. Subjects ran the gamut from technical innovations from the company's research and development laboratory to social and political issues relevant to electronics technicians, hobbyists, students, and engineers. Being that it was a presidential election year in the U.S., National Company felt compelled to remind readers of their patriotic duty to vote. Although this was the December issue, it would reach readers' mailboxes prior to the election. Dwight D. Eisenhower ran against Adlai Stevenson. The latter won the South and the former won everything else. 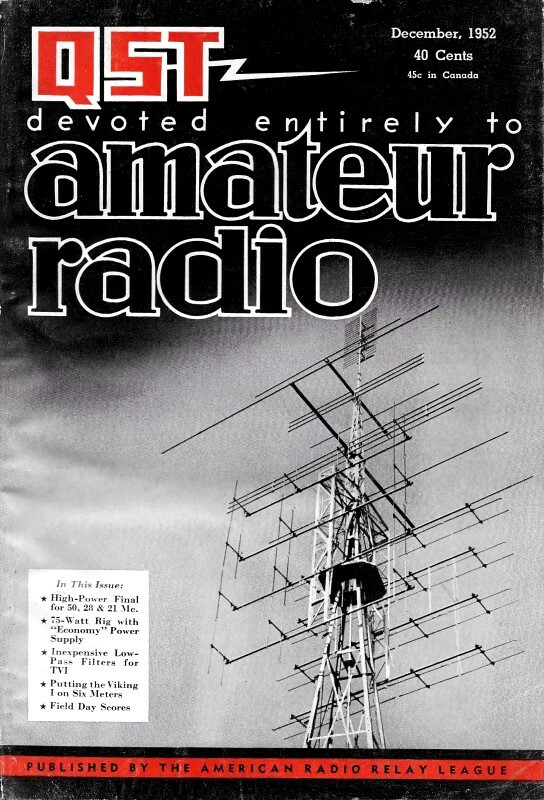 Note the thinly veiled remark at the bottom about why amateur radio participation rate was down at the time. 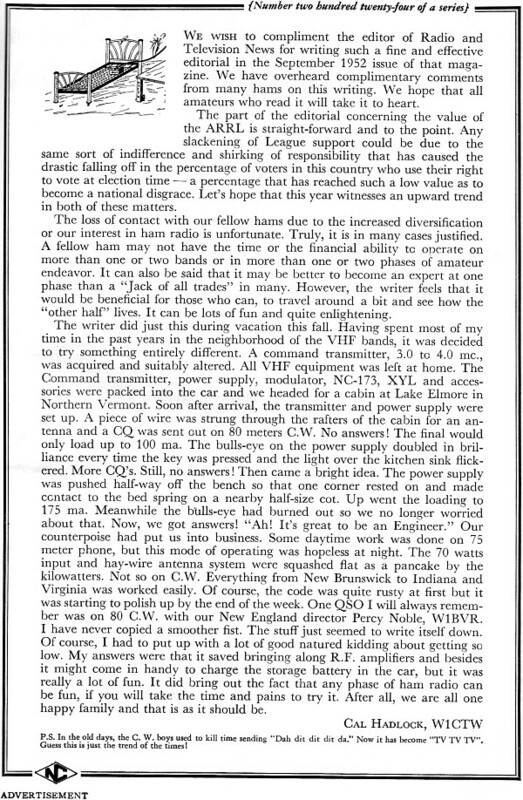 We wish to compliment the editor of Radio and Television News for writing such a fine and effective editorial in the September 1952 issue of that magazine. We have overheard complimentary comments from many hams on this writing. We hope that all amateurs who read it will take it to heart. The part of the editorial concerning the value of the ARRL is straight-forward and to the point. Any slackening of League support could be due to the same sort of indifference and shirking of responsibility that has caused the drastic falling off in the percentage of voters in this country who use their right to vote at election time - a percentage that has reached such a low value as to become a national disgrace. Let's hope that this year witnesses an upward trend in both of these matters. The loss of contact with our fellow hams due to the increased diversification or our interest in ham radio is unfortunate. Truly, it is in many cases justified. A fellow ham may not have the time or the financial ability to operate on more than one or two bands or in more than one or two phases of amateur endeavor. It can also be said that it may be better to become an expert at one phase than a "Jack of all trades" in many. However, the writer feels that it would be beneficial for those who can, to travel around a bit and see how the "other half" lives. It can be lots of fun and quite enlightening. The writer did just this during vacation this fall. Having spent most of my time in the past years in the neighborhood of the VHF bands, it was decided to try something entirely different. A command transmitter, 3.0 to 4.0 mc., was acquired and suitably altered. All VHF equipment was left at home. The Command transmitter, power supply, modulator, NC-173, XYL and accessories were packed into the car and we headed for a cabin at Lake Elmore in Northern Vermont. Soon after arrival, the transmitter and power supply were set up. A piece of wire was strung through the rafters of the cabin for an antenna and a CQ was sent out on 80 meters C.W. No answers! The final would only load up to 100 ma. The bulls-eye on the power supply doubled in brilliance every time the key was pressed and the light over the kitchen sink flickered. More CQ's. Still, no answers! Then came a bright idea. 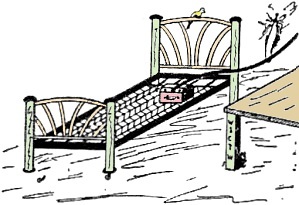 The power supply was pushed half-way off the bench so that one corner rested on and made contact to the bed spring on a nearby half-size cot. Up went the loading to 175 ma. Meanwhile the bulls-eye had burned out so we no longer worried about that. Now, we got answers! "Ah! It's great to be an Engineer." Our counterpoise had put us into business. Some daytime work was done on 75 meter phone, but this mode of operating was hopeless at night. The 70 watts input and hay-wire antenna system were squashed flat as a pancake by the kilowatters. Not so on C.W. Everything from New Brunswick to Indiana and Virginia was worked easily. Of course, the code was quite rusty at first but it was starting to polish up by the end of the week. One QSO I will always remember was on 80 C.W. with our New England director Percy Noble, W1BVR. I have never copied a smoother fist. The stuff just seemed to write itself down. Of course, I had to put up with a lot of good natured kidding about getting so low. My answers were that it saved bringing along R.F. amplifiers and besides it might come in handy to charge the storage battery in the car, but it was really a lot of fun. It did bring out the fact that any phase of ham radio can be fun, if you will take the time and pains to try it. After all, we are all one happy family and that is as it should be. P.S. In the old days, the C. W. boys used to kill time sending "Dah dit dit dit da," Now it has become "TV TV TV". Guess this is just the trend of the times!